I get the heebie jeebies when I have to set my iPhone alarm to wake me up for a very early appointment. I always fear I will fall back to sleep. This week I had two doctor appointments at 7:30 am, so I had to be up two hours beforehand to get ready. Yes, I need two hours to prepare. Unlike most women I wash my hair everyday, and I meditate in the shower. This takes time, and I really can't start the day without each ritual. While I automatically wake up every day at 5:30 am, I get very concerned that I will oversleep on the day that I have to be out the door on the early side. I just don't trust the iPhone alarm (or any alarm for that matter) to wake me up and keep me up. Consequently, I never fall asleep on the nights that the alarm is set. I toss and turn, with one eye on the clock. Tomorrow may be a different story because I am going to try a new alarm app called Walk Up. It has a very unusual way of making sure you are up and out on time. You actually have to get out of bed and go for a walk to shut it off. The concept is pretty smart. The app uses the iPhone’s built-in accelerometer to track movements. 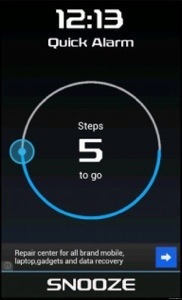 You are required to take a bunch of steps before it can be turned off. If you are very ambitious, you can program it to shut off after taking 100 steps. That’s up to you. I may be very industrious tomorrow morning and set the alarm for a stroll. I could use the few extra steps to get these stiff bones moving. Kind of like being awakened by a pet who needs to be taken out. You don’t think twice. Otherwise, you might have to swim your way to the kitchen. And that’s no fun! The app is not free. It costs a whopping $0.99.